US President Donald Trump has paid tribute to an ex-aide who quit this week amid domestic abuse allegations. "We wish him well," he said in his first public remarks on the claims against ex-White House staff secretary Rob Porter. "He worked very hard." Chief of staff John Kelly reportedly offered to resign his post over his handling of the matter. It is alleged Mr Porter, 40, gave one ex-wife a black eye while another filed a restraining order. He denies it. Despite the allegations, he received interim security clearance to act as gatekeeper to the US president. Mr Porter resigned on Wednesday. Mr Trump's remarks come a day after the White House said it could have better handled the accusations. 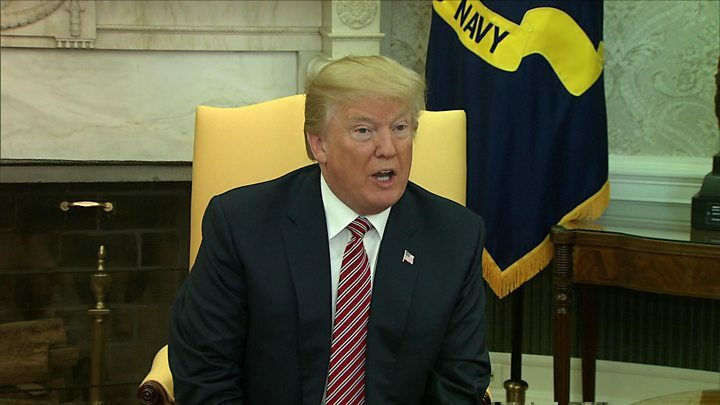 Speaking in the Oval Office on Friday, Mr Trump said: "We found out about it recently and I was surprised by it, but we certainly wish him well and it's a tough time for him. "He did a very good job while when he was in the White House. "And we hope he has a wonderful career and he will have a great career ahead of him. "But it was very sad when we heard about it and certainly he's also very sad now. "He also, as you probably know, says he's innocent and I think you have to remember that." Mr Trump did not refer to Mr Porter's accusers. But US Vice-President Mike Pence condemned Mr Porter, saying he was "appalled" by his alleged behaviour. "There's no tolerance in this White House, no place in America for domestic abuse," he told NBC. Mr Porter's ex-wives, Colbie Holderness and Jennifer Willoughby, both accuse him of physical and emotional abuse. His first spouse, US government analyst Ms Holderness, said he kicked her on their 2003 honeymoon in the Canary Islands and punched her in the face a couple of years later on holiday in Florence, Italy. Ms Willoughby says she was married to Mr Porter from 2009-13. The motivational speaker says she obtained a protective order against him in June 2010 after he punched the glass of the door at their Alexandria, Virginia, home. Without naming him, she wrote about her experiences in a blog post entitled Why I Stayed. A third woman who says she was Mr Porter's girlfriend contacted his ex-wives in 2016 with allegations of "repeated abuse", according to CNN. The unnamed woman was reportedly seeking advice on how to leave Mr Porter, but said she was afraid of him. Mr Porter said "these outrageous allegations are simply false". What's the White House fallout? Chief of Staff John Kelly had some knowledge of the accusations against his deputy. The White House has denied reports that Mr Kelly offered his resignation over the matter. The chief of staff initially called Mr Porter "a man of true integrity and honour" after the Daily Mail reported the ex-wives' allegations on Tuesday. He then released a new statement saying he was shocked by the claims and stressed domestic violence was unacceptable. White House communications director Hope Hicks' handling of the controversy has reportedly displeased Mr Trump. The 29-year-old aide has recently been in a relationship with Mr Porter, a Harvard graduate and former Oxford Rhodes Scholar. Mr Trump was reportedly not consulted when Ms Hicks helped draft an initial statement defending Mr Porter. According to CBS News, Mr Porter approached White House Counsel Don McGahn in January 2017 to inform him his ex-wives might say unflattering things about him to background check investigators. In June 2017, Mr Porter's preliminary file was sent from the FBI to the White House security office, containing the abuse allegations. In November, Mr McGahn received a call from an ex-girlfriend of Mr Porter alleging physical violence by the aide. Mr McGahn told the White House chief of staff there was an issue with Mr Porter's security clearance, although he was vague, reports CBS. Mr Porter told Mr Kelly his ex-wives were saying false things about him. A White House spokesman said on Thursday that Mr Kelly did not realise the extent of the claims until a photo of Ms Holderness' black eye emerged on Wednesday.